Flipped learning: training got there first with flipcharts! We’ve all been there. That collaborative event where you’re forced to sit at round tables and asked to select a chair The trainer then poses some questions which you’re expected to answer with the Chairs of each table feeding back to the group as a whole, while someone writes it up on flipchart sheets and pins them on the wall, so that it can be collated and sent out to everyone. What actually happens is that the extrovert quickly volunteers to be the chair (or becomes chair by default as no one else can be bothered), the table spends too long deciding what the ill-formed question actually means or shoots off on obscure tangents, the question forgotten. The chair then feeds back their own thoughts, ignoring all other contributions. Sure the flip chart pages are pinned up on the wall with bluetac, ruining the paint work, but you never, ever get the feedback sent to you afterwards. This is what passes for collaboration in training, an tired-old ritual that is generally a waste of time. It’s illusory learning, pretend collaboration and just one of those awful things that only happen on awful training courses. I really do want to flip my proverbial lid when these sessions are suggested. OK, the flipside of flipcharts is that they do have their uses. They’re a bit boring, but big enough to be seen by small audiences and small enough to be used by a presenter and a little more small scale and human than a massive projection. For small group brainstorming and sport’s coaching, they can be useful. Of course, they don’t require batteries or computer technology, so many trainers see it as a safe bet. Unlike PowerPoint, paper is designed to be written upon, and so you can capture the thoughts of learners. Its popularity among trainers is due in some part to its suitability to small audiences in courses with fixed content. Some flipchart tips include; writing straight by ruling faint lines before you start, write words or images in faint pencil and amaze learners with your free-flowing sketching skills or write faint notes to keep you on track. 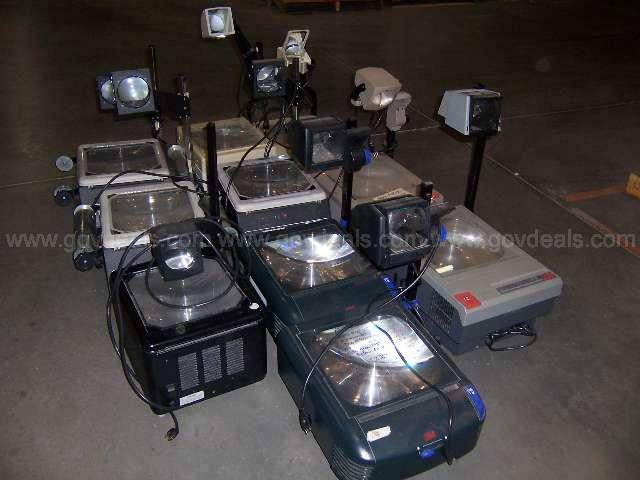 This lots of overhead projectors were being sold for 20 bucks in a government auction. Junk now but many will recall teachers, trainers and lecturers arrive with boxes or bags of acetate slides and then the boredom would begin. An odd trapezoid shape, would appear, be brought into focus, projected in dark rooms with a disembodied voice explaining all at the front of the class, often writing, writing and writing. Overhead projectors do just that, project writing and slides by projecting light from a lamp up through the transparency then through a mirror and lens that sits above the acetate on an arm forward through ninety degrees to a screen. Despite the powerful lamps needed for this form of projection, that had to be cooled by fans, the image was often quite dull and yellowish. The first recorded use was by the US police but it gained popularity during the second world war in the US Army. Sales were stimulated into schools by the federal Aid to Education budget in 1957 and overhead projectors became ubiquitous in education and training until relatively recently, when they were replaced by computers and projectors. Easy to mock but as teaching technology it had the advantage of allowing the teacher, instructor or lecturer to look forward at the class, rather than turning round to a blackboard, PowerPoint users. It was designed for live writing as it sat at a comfortable height, unlike blackboards. And as the text was projected, one could write at normal size normally, as opposed to writing unnaturally, large text on a blackboard, holding up one’s arm for long periods. You could use pre-printed acetates or write at will. This allowed one to take the acetate sheets out in whatever order required, as opposed to the tendency to stick to a fixed sequence in PowerPoint. Nevertheless, it is still the heir to the blackboard and a teaching technology that took teaching back, physically and pedagogically to the teacher talking and presenting to passive listeners. 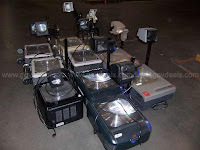 As the dominant form of teaching technology for most of the second half of the 20th century, overhead projectors had several pedagogic advantages but in the end they were too bulky, had poor projection qualities and gave way to computers and projectors. In the end they are tools for projecting the thoughts of teachers and may be seen, like blackboards and the later PowerPoint, as seeing teaching as preaching. James Pillans – never heard of him? He invented ‘chalk and talk’! You are unlikely to have heard of James Pillans (1788-1864) but he had a direct, lasting and profound effect on teaching and perhaps less on learning. Why? He invented the blackboard (chalkboard in US), which he used to teach geography using coloured chalks. He was the Headmaster of the Edinburgh’s Old High School, later (1820-1863) Professor of Humanity & Laws in the University of Edinburgh. The technology has evolved from a flat piece of slate, written upon using chalk sticks (actually gypsum), to boards painted with matte paint. Green paint was adopted when it was found to be easier on the eye. Stronger, longer lasting boards were also developed of porcelain and enameled steel. Eventually, flexible materials were used that could be rolled round in a loop, to preserve written material. Some were put on wheels to be rolled in and out of position and in higher education multiple blackboards are still piled high on walls,. Chalk was used as it was easily available, cheap and could be wiped off with a damp cloth or felt covered pad. Blackboards have had an effect on teaching and learning that still prevails today. They changed the dynamic between student and teacher. Advantageously the teacher could write things on the board to be seen by the whole class (if legible) but this led to less interaction with students, less dialogue and less of what could be called the Socratic approach to teaching and learning. It led to more presentation by ‘writing’ and put far more focus on straight exposition by the teacher. It is essentially a broadcast medium, written by the teacher and seen by the whole class, with easy erasure. A more extreme form of chalk and talk is commonly seen in highly abstract subjects such as maths and physics, where lecturers literally write screeds of equations across multiple blackboards for most of their lecture. It is not uncommon for lecturers in these subjects to have poor social skills and a tendency to turn their backs to their students to write what they regard as model exposition. In practice it is rare that all students can follow this flow at the same speed as the delivery of the teacher. The problem can be mitigated by recording lectures for further perusal by students, and this has been shown to increase attainment. Interestingly technology continued to reinforce this ‘chalk and talk’ pedagogy, with the introduction of 35mm slide projectors, overhead projectors, flipcharts, computer projectors, PowerPoint and whiteboards. The direct descendant of the blackboard is the interactive whiteboard. Considerable investments have been made into buying and installing interactive whiteboards into schools, yet the evidence for a return on this investment in terms of outcomes has yet to be realised. Many remain unused for most of the time or only used to present content with little use made of their interactive abilities. The primary problem is the ‘one to many’ relationship between teacher and students in the classroom. It can be awkward and difficult to get student interaction in this context. There is barely a classroom or lecture hall in the world that does not, or did not, have a blackboard, apart from progressive schools such as Montessori and Steiner schools, who eschew whole class instruction. Interestingly, something designed for classroom use has also migrated to restaurants, bars and even in the home as an errand pad. It has played a key role in pedagogy as it promoted what is commonly called ‘chalk and talk’ teaching, where the teacher largely talks at students. This has remained a problem in schools globally as it has prevented, well-researched and more sophisticated pedagogic approaches from entering the classroom, and is often a default for poorly trained teachers. The book gave the hardware of the book a boost in terms of its software, the text. Page numbers content pages and indexes could all be added to aid navigation. This scroll versus page technology divide lives on today in screen technology, where page based web pages live alongside vertical scrolling. We can see this in Wikipedia, with its page structure for entries with scrolling for reading. Window panes add depth making multiple tasks possible. 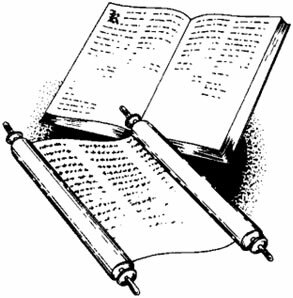 Another interesting scroll versus page structural debate concerns the modern scroll of film, then video. The media of the moving image were literally the technology of reels or scrolls but now handled by delivering fast refresh pages. However, in terms of learning, the distinction between the continuous scrolled presentation of content versus pages under the control of the user, remains a sharp divide. It is still difficult to search and navigate video content for learning purposes. The navigation of forward, back and fast forward remain at the navigational level of ancient scrolls. It is useful to separate the hardware and software components of books, as the word ‘book’ has two meanings. First, the whole physical object of paper and text; second, just the text. Authors don’t write books, they write texts. It is publishers who package texts into books by commissioning covers, paper type and weight, font and other features. A book, as hardware, is light, portable and never runs out of battery. It is undoubtedly an attractive, well bound, object that doesn’t break when dropped and is easy to hold for reading. Even its flexibility makes it comfortable to hold or lie on one’s lap when read. The physical pages make it easy to know where you are in a book and how much you’ve completed. Paper, as a reflective medium, is also eminently readable. Block shaped books also makes them easy to store on shelves. There can be no doubt that the physicality of the book contributes to its appeal. 4. capitalised for sentences & emphasis. All of this took centuries of slow incremental progress. Note that these are features of the text, not the physical book. This is the software, not the hardware. For most of the technological advances in books were either in the process of production (printing, ink and paper) or software improvements. Although the book, as a physical technology, has developed over nearly eighteen centuries into finely-honed, much loved, object, that technology is being challenged by screen based reading and writing. There has been a social explosion of publishing, writing and reading on screens, aided by the internet. This has been boosted by good, readable screen technology, mobile devices and inexpensive e-book readers. Traditionalists may wave their reading glasses in horror but to turn books into a fetish is simply to deny the inevitable. Real books are great, but let’s not confuse the medium with the content, or hardware with software, namely books with texts. Just as journalists and newspaper owners fail to realise they’re in the ‘news’ not the ‘newspaper’ business, so book fans and publishers sometimes fail to realise that this is about writing and reading, not books. Books are simple a piece of technology. Just as the book was a hardware improvement on the technology of the scroll, so screen technology is an improvement on the hardware of the physical book. Books destroy trees, require landfill and are expensive to transport and store. In turning atoms into bits, books become weightless, distribution trivial and the problem of storage disappears. We can now see where this can lead us, or more specifically lead us in improving learning. Why lock up knowledge and the ability to learn in libraries, schools and physical books, when we can publish and distribute it at marginal cost to everyone. There is a tendency to think of books as being an intrinsic good, but many would question the role of Adolf Hitler’s Mein Kampf and Mao Tse Tung’s Little Red Book as instructive or progressive. Similarly, many would doubt that the literal reading of sacred texts, such as The Bible, Torah and Koran, are always forces for good. Professor Pierre Bayard ‘s How to Talk About Books You Haven’t Read is a deep analysis of the ambiguous role of readers and books. We take books too seriously, forgetting that many are bought and not read, skimmed or talked about as if they had been read, even forgotten. Bayard throws the book at books. Books have a special status as ‘almost objects of worship’ and non-readers are stigmatised. Yet reading is often non-reading, as we forget most of what we read, almost as quickly as it is read. As we forge forward, content is forgotten and disappears in the wake of memory. Most reading is forgetting. He’s really on to something here. I habitually underline, mark, comment and summarise on the books I read. Yet it is almost taboo to underline, mark books, and blasphemous to tear out a page or chapter. Life is short and books are long. It’s OK to skim, as many books are padded out to conform to the standard 250 page norm. In fact, for many, the fact that most of what you read will be forgotten, means a summary is adequate. What’s clever is the way he hauls in authors to support his case. Montaigne’s honest reflections on reading, Oscar Wilde’s ‘100 worst books’ (books we should not read), David Lodge’s expose of the Academy’s dependence on unread books. Umberto Eco, Balzac, Green, Shakespeare, Joyce, Proust and others are all used to build a case, not against books, but against the bogus idea of books as being pure and sacrosanct. So reading, and the culture of reading, is not what we think it is. 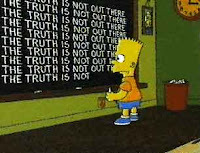 It’s full of deceit, snobbery and false claims. Bayard exposes many of these taboos. Take a leaf out of his book and see reading, not as being synonymous with books, but in all its wonderful variations in terms of style, length, authors and media. New media and self-publishing are tearing apart the myth that reading is synonymous with books. It may well be that reading in many ways has freed itself from the tyranny of books. The Book (codex) was a superior technology to the scroll and in the form of hand written manuscripts had a good 1200 year run. The printing press scaled up the process of replication and has had another good 500 year run. Building on this, screen based reading has given us another massive boost in scalability, making books weightless, volumeless, easy to distribute and searchable. What we are witnessing is, perhaps, the death of the book as the dominant form of written expression. A much wider range of forms of expression have emerged. Wikipedia is not really a book in the sense that the Encyclopedia Britannica was a book. Txting, posting, commenting, blogging are challenging the long-form book as the writing and reading medium of choice. Books themselves are being seen as just one form of expression among many. Lecterns: technology of teaching or preaching? 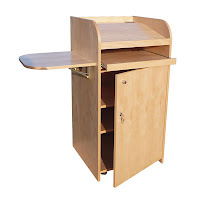 Educational furniture often has the whiff of pomposity and the ‘lectern’ stinks of the stuff. That most visible symbol of that disastrous carry-over from church to university, the lectern, speaks volumes about the pedagogic poverty of the lecture. It’s a phoney pulpit from which teachers play at being priests. What it encourages is the view that knowledge is fixed. The books that lay on the lectern were meant to be read aloud, the fixed scripture of the Bible, Koran or Torah. The lectern says “the book which is laid on this altar is holy and must be believed, or thou shall go to hell, or worse, fail thy exams”. 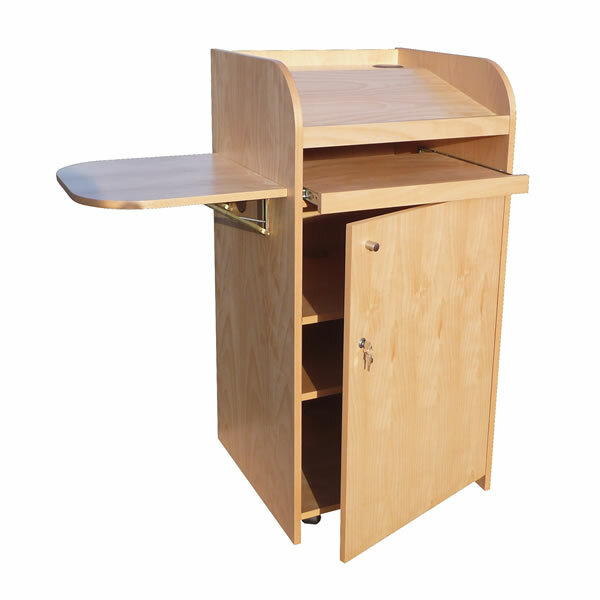 What lecterns do is encourage dry lectures. That padded out, one hour (Babylonians had a 60-based number system) of relentless speech that has far more to do with lazy preparation than pedagogy. Give people who are inexperienced at teaching a prop and they'll use it and use it to literally prop up themselves and poor teaching, whether it be lecture notes or text-ridden Powerpoint. The lectern fixes knowledge but it also fixes the speaker. It roots them to the spot and encourages that insidious practice of reading a lecture from notes or worse, verbatim from sheets of paper, or even more ghastly reading out a published paper. This destroys teaching in Higher Education, and kills conferences stone dead. Generation after generation of students get spoon-fed, or worse bored rigid, by this repetitive reading. When the lecturer lectures from a lectern, profession, practice and pomposity all meet on this one spot. My heart sinks when a speaker stands stock still behind this wooden palisade, scared to come out and show themselves, fearful of the reaction. My heart sinks even deeper when I see the glasses go on and the sheaf of notes appear. I know I’m soon to experience psychological distress as the nodding movement from paper to audience casts the spell of indifference across the entire lecture or conference hall. I’ve seen people step behind a lectern and say, “Good morning, my names is (glance down) Nigel Jobsworth, from the Department of Regurgitation or University of Dullsville, and I want to speak to you today about (glance down) this very exciting subject… (reading from paper). I’ve seen speakers reduced to sweaty, quivering wrecks because their notes have ended up in the wrong order. Without the written word they’re confused mutes. I’ve seen a Russian Professor at a UN conference talk for a full hour (to the minute) in a monotone voice, ignoring even punctuation, from her notes, announcing at the end that she was a Professor of Communication (I kid you not) from the University of Moscow. So hypnotised was I by this act of absurdist theatre that I neither understood nor remembered a single word. Academic and political oratory have been dealt a death blow by the steady retreat away from speaking honestly from your own mind, towards speaking literally from notes. In the case of politicians, it is notes written by flunkies, who strip life away leaving nothing but the banal bones of written prose or what they think are soundbites, but sound like the clichés they are. Just as bad are the academics who seem to think that lectern delivery exudes academic seriousness. It doesn’t. Reading is not teaching. The lectern is only any good for holding a laptop. It’s something to walk away from, to avoid. Think TED and you can’t go far wrong. Technology of punishment in learning? Surely not. I’m a huge fan of the running gag in The Simpsons credits, when Bart has to write lines on the blackboard. Blackboards have long been used as instruments of punishment where pupils are asked to write the same line a set number of times. ‘Lines’ often had to be written in detention, after school. Many claim that linking punishment to writing is a strong demotivator, as future writing talks are likely to be associated with punishment. Others argue that writing practice is both a punishment and useful exercise. The argument around corporeal punishment in schools - useful for discipline or child abuse - has been raging for two millennia. From Sparta and Rome to the public schools of England, punishment has been seen as a necessary condition for education, especially of boys. Spartan education was militaristic and punishment (flogging) was common. Indeed stealing was seen as a virtue, only being caught shameful, and the ability to take pain a mark of courage. In Rome schools had a range of technology for beating students including the ferula (birch branches), scotia (leather whip straps) and the hardest leather whip the flagellum. The pointed ‘dunces’ hat, sometimes with a ‘D’ on it, was put on the heads of pupils who misbehaved and they were made to stand in the corner, sometimes with their face to the wall. The name comes from the Scottish theologian Duns Scotus, whose followers stubbornly refused to adopt to the new humanities and so ‘Duns’ became a byword for stubbornness and stupidity. 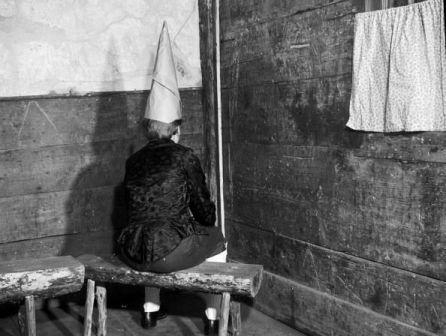 The word dunce first appears I the middle of the 17th century and ‘dunces cap’ first appears in The Old Curiosity Shop by Charles Dickens. In Europe there was an equivalent, a headdress resembling a donkey’s ears, to indicate ‘stupidity’. Spanking buttocks with canes was widespread, especially in English speaking public schools until relatively recently and is quite clearly responsible for what the French call the ‘vice anglais’ or ‘spanking’ on the bare or clothed buttocks. It was widely represented in novels, films, as a key aspect of British schooling. Rattan spanking canes, used for corporeal punishment came into common use in the late 19t century, when it was found they could deliver seething pain, even through clothes. The practice continued, largely in the English speaking public schools, usually by the headmaster but also by prefects, and although banned in most countries, still exists today. Corporeal punishment was banned in England & Wales in 1999, Scotland 2000 and Northern Ireland in 2004. Although it still lingers and is still commonly used in Iran, many sub-Saharan and African countries, such as Zimbabwe and in Singapore and Malaysia. 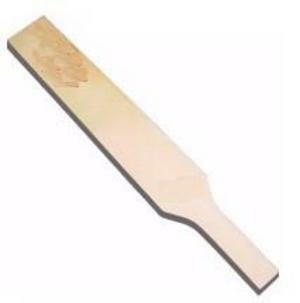 In the US spanking on the buttocks with a foot long wooden or fibreglass paddle is legal in 19 states, mostly in the mid-west and south; Alabama Arizona Arkansas Colorado Florida Georgia Idaho Indiana Kansas Kentucky Louisiana Mississippi Missouri North Carolina Oklahoma South Carolina Tennessee Texas and Wyoming. Up to 20,000 students a year request medical help after being paddled. Some see it as a distasteful hangover, all too common in ‘black’ states. Others see it as child abuse and there are on-going legal cases. 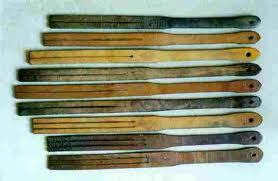 The ‘strap’ or ‘belt’ was the mainstay of corporeal punishment in Scottish Schools. It was a thick leather strap, forked at the end and applied to the outstretched hands. I can still vividly remember the pain, burst blood vessels on my wrist and injustice for being late for school (it was the bus not me that was late!). The Lochgelly Tawse had the largest share of the market as it had no sharp edges, didn’t wrap round the hand and was lighter and easier to use. As a piece of technology it was exquisitely designed as an instrument of pain and punishment. Whips have been used for centuries in schools. A worrying trend, however, is its routine contemporary use in Koranic schools, not just for bad behaviour but for failing on simple recitations, reading and writing tasks. Punishment in this context is largely around routine, rote memorisation tasks. In an interesting technology twist, mobiles in classrooms have exposed some of the excessive brutality inflicted by teachers in some countries and have led to prosecutions and changes in government policy. Take these horrific examples from Thailand and South Korea. There are many others. Even in Roman times, the debate raged over the corporeal punishment of children. Quintilian (35-95 AD, was "entirely against corporal punishment in education... it is disgusting and slavish…the pupil whose mind is too coarse to be improved by censure will become as indifferent to blows. Finally, these chastisements would be entirely unnecessary if the teachers were patient and helpful…..And consider how shameful, how dangerous to modesty are the effects produced by the pain or fear of the victims. This feeling of shame cripples and unmans the spirit, making it flee from and detest the light of day." Quintilian addresses the main issues, 1) it’s degrading; 2) victims become indifferent; 3) teachers need to find better methods; 4) demotivates and cripples the mind. Other arguments against include the possibility of showing that hitting others is acceptable, increasing aggression in children and possible trauma. These arguments were to eventually win the day and corporeal punishment is now banned in many developed countries. The technology of punishment, based on the pedagogy of retribution and deterrence has long been part of education systems around the world. It was long believed to be an effective tool, especially for bad behaviour among boys. Interestingly, corporeal punishment is highly selective on gender. It has also been used to punish failure and at its most extreme to instil fear and push rote learning of set texts. The argument for corporeal punishment in schools still rages, however, the practice has been banned in many countries and the general move is towards its eradication. It’s useful to remind ourselves that technology in schools is used for a very wide range of practices, some less palatable than others. This is St Jerome, who translated the Bible into Latin, and it speaks volumes about the medieval, monastic scribe. Note the lined parchment, where a plumb line was used to draw parallel lines. The codex is on a lectern, at an angle to control the flow of ink, and the curtain is drawn back to give more light. In his hands are a quill pen and a knife for scraping away errors and sharpening eth quill. Paper only became common in the 1400s and at three to four pages per day even the best scribe made a mistake per page (erased by scraping with knife or pumice stone). This was painstaking work but it’s the illuminations that took the real artistry, time and effort. Widely admired, these illustrated manuscripts are much admired by book lovers. But what effect did they have on the dissemination of knowledge and learning? Manuscript literally means written by hand but this meant that books were scarce and existed in a culture of fixed knowledge and deference. At the end of the Roman era literacy plummeted and for over a thousand years civilisation, especially the culture of writing and reading, was reduced to a small number of scribes and a medium available largely to elites. Illustrated manuscripts are the luxury goods of religion and royalty. Their scarcity was their strength. We must remember that books like this were rare. Incredibly expensive to produce, they were owned and treasured by the elite. Indeed, the manuscripts are overwhelmingly about the two great institutions of the state - Church and Monarchy. Print is power and politics, so a manuscripts is never just a manuscript, it is a device for religious certainty, conviction, conversion, dogma, flattery, preferment, a claim to legitimacy, a contract, a confirmation of status. This has little to do with learning. However, what manuscript culture gave us was the shift from reading ‘aloud’ to devotional ‘silent’ reading. This led to the development of spaces between words, punctuation, paragraphs, capitalisation, page numbers, contents pages and indexes. 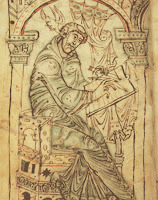 This demand for books was to lead to technological advances that were to free texts from the the age of the manuscript. As writing became the medium of religion, Buddhism in China and Asia, Judaism, Christianity and Islam in the Middle East and Europe, so manuscripts became, not objects of open learning, but texts to be read aloud, memorised by rote learning and believed. Beautiful as they were, they were the instruments of fixed thought, orthodoxy and control. We have an interesting example in the history of written culture with Islam. Islam was a conduit for many ancient texts but remained stubbornly fixated with 'written' and copied texts, so remained in the manuscript ‘written by hand’ age well into the 19th century. The Ottoman Sultan Bayazid banned printing completely across the entire empire in 1485. It wasn’t until 1727 that this law was repealed, even then only for secular books. This eventually had a devastating effect on the Islamic world’s contribution to knowledge, science and learning. It wasn’t until the second half of the 19th century that printing became commonplace. Koran means ‘recitation’. It was meant to be read aloud and endless recitation and memorising of the book, through repeated spoken readings, has always been highly prized in the Islamic world. But this comes at a price. This repeated repetition is massively effective in learning and results in the deep processing and retention of the text, and the dogmatic convictions that come with deeply held knowledge and belief. Manuscripts were largely objects of religious dogma and therefore the enemy of learning in the sense of new ideas and critical analysis. Remember that the Catholic Church still had a prohibited books list until 1966. To be clear, the list included; Jean Paul Sartre, Simone de Beauvoir, Voltaire, Denis Diderot, Victor Hugo, Jean-Jacques Rousseau, André Gide, Immanuel Kant, David Hume, René Descartes, Francis Bacon, John Milton, John Locke, Galileo Galileo and Blaise Pascal. Giordano Bruno was burnt at the stake for his writings. So religious control really meant control and censorship. Spanish conquerors burnt one civilisation’s entire literary output. Writing had been invented, independently, in Mesoamerica and there was a rich tradition of religious, astronomical and other literature, yet Bishop Diego de Landa ordered the collection and destruction of all Mayan manuscripts. Only four survived. 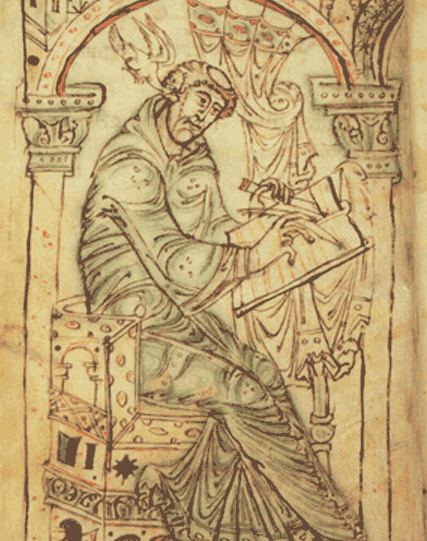 It was not just religious groups who were suspicious of manuscripts. Henry VIII was a censor who tried to ban reading, even of the Bible, by apprentices and women. Elizabeth I did the same through The Stationer’s Company. So Royalty, far from being bibliophiles promoting reading and writing, were narcissistic owners and censors. 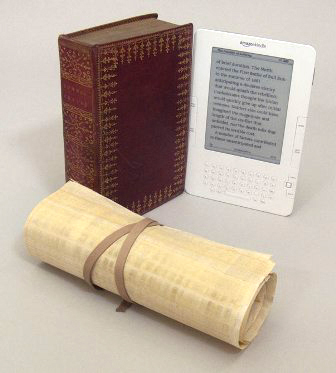 fGutenberg, and Caxton, did truly revolutionised the replication and scalability of the writing and reading of books. Magnificent manuscripts give us a direct causal link with the past. The Book of Kells is a masterpiece. There’s even annotations in Henry VIIIs own hand in the margins. The Mathew Paris 13th C journey to the Holy Land is an intriguing strip map, as he certainly never did the journey himself. You can wallow in the few books that did exist over these many centuries but don’t fall for this being in any way a golden age for books and learning. Manuscript culture was in many ways the enemy of learning. It fixed learning in a pattern of endless copying and repetition. Manuscripts fossilised knowledge and kept it in the hands of church and rulers. 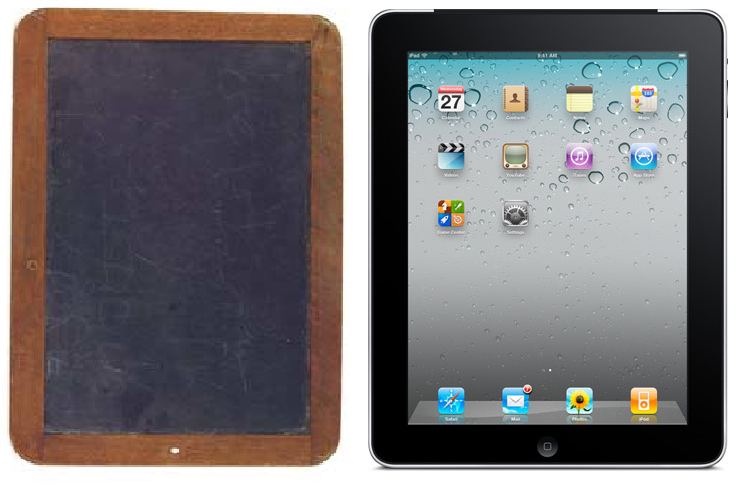 School slates – the original iPads? iPads remind me of school slates. Mobile devices with the same frame, same aspect ratio, same weight, easy to use, can be used them portrait or landscape and has erasable content. If anything the slate is cheaper, harder to break, has superior, nay almost indefinite, battery life and works in all light conditions. Importantly, both devices shift learning into the hands of the learner, away from the giant slate that is the chalkboard or giant iPad that is the whiteboard. Small slate boards, used with slate pens and scored (lined) for writing, go back as far as the 14th century, and are mentioned by Chaucer, however, their popularity in education came with the rise of mass schooling in the early 19th century. In particular, the Lancastrian system which defined specific teaching methods and evangelised the use of slates and slate pencils, within a defined system of teaching and learning. Lancaster saw slates as the key technology for learners in reading, writing and arithmetic. They lay at the heart of his pedagogy, a systematic set of practices for teaching. Slates, he thought, put the power of learning into the hands of learners and encouraged practice and attention, and also enabled the supervision in a large class by the teacher. Slates were much cheaper than paper. Indeed Lancaster provided detailed return on investment calculations to show that they were many times cheaper than pen and paper. There was less waste and they were very durable. Similarly with slate pens. Slate was readily available and a recommendation for local schools was to reuse and polish roof slates from demolished buildings. It is thought that this phrase comes from the practice of school monitors to record absence or bad behaviour on their own monitors’ slates. In classes that frequently topped a hundred, assessment was a problem. But there is a more serious pedagogic practice at play here, as Lancaster recommended that students hold up their slates and turn them towards the teacher for whole class assessment, similar to modern clicker systems. In his system, classes were based on performance and not age, with constant movement, so this sort of continuous assessment was important. One can argue that this sort of continuous, whole-class, assessment recommended by William () has been lost today. The slate may is making a technological comeback, in the form of the many tablets on the market. They are remarkably similar in look and shape, yet centuries apart in technology. Indeed, the term ‘slate’ has been used for slimmer tablets, without keyboards, used for browsing and media access. Their lightness and ease of use and strength as e-book readers, some argue, make them useful for learning and there has been enthusiastic use in schools and Universities. The early evidence is encouraging but time will tell. Slates have been used for centuries for writing, with their heyday in the 19th century as the need for universal schooling demanded cheap learning technology. It was only when cheap paper became widely available that people moved on. Let’s give slates their due. They were the affordable tablets of the day and played a key role in the improvement of literacy and numeracy for millions of children. Printing is seen as a big moment in the history of technology yet the role of the material upon which words were written, or printed, is as important, and easy to underestimate. To write, and importantly, to be widely read, one needs a medium for distribution. The media upon which writing was written includes; clay, potsherds, stone, bones, shells, papyrus, silk, bark, parchments, slates, paper and eventually electronic screens. Scalability has come first through the use of easily available natural materials, then the manufucture of papyrus and paper and finally the digital revolution where massive scalability comes through electronic replication. The medium used to record writing has undergone several important advances, all with powerful pedagogic consequences. The move from clay to papyrus was significant as it was portable, lighter, easier to flatten out and sheets could be glued together to form scrolls of great length, up to 6 meters and longer. It was also better for brushes and pens, easier to write on and produced faster, cursive writing. The downside was that it was expensive, as supply was limited largely to the Nile delta in Egypt, who kept the method of manufacture a secret. It also had a vertical and horizontal grain, so could only be used on one side. Parchment started to appear in the 1st century AD, from Pergamum in modern Turkey but was eventually made everywhere.. In Europe, papyrus suffered in the damp conditions, whereas parchment (animal skins) were far more durable, could be folded, stitched together in codexes (manuscripts) and because it is opaque can written on both sides. It can also be scraped clean to be used again. Again, like papyrus, it was difficult to make and remained expensive. One bible could take hundreds of calfskins selected from thousands of skins, many of which are blemished. The use of cheap wax tablets and slates, allowed schools to distribute cheap, erasable, reusable writing technology to all learners. But it was the availability of cheap paper that allowed mass printing, replication and scalability. Paper, invented by the Chinese around 105 AD, used rags, hemp, bark and meshed fishing nets to produce the first dried and bleached paper. It moved beyond China around the 7th century but only reached Europe via Moorish Spain in the 12th century. It is cheap paper that made printing possible. Indeed, paper manufacture became much cheaper in the 19th century when Fourdrinier (1799) and Gilpin (1816) produced machines that could output paper in huge, wide rolls. Then in the 1860s paper produced from wood pulp, rather than rags, and the price plummeted. Book prices fell by 50% and the demand for clean, white pages led to the addition of bleaching with chlorine. Cheap paper could be printed and distributed on new rail networks. Newspapers flourished and postal services led to mass letter writing. For learning, cheap paper gave us books for the dissemination of knowledge but also empty notebooks and exercise books for students to take notes, practice and do exercises. It is paper that put mass writing in the hands of learners. Of course, paper has many uses. It's everywhere; books, newspapers, wallpaper, lampshades, cups, plates, paper bags, hats, insulation, filters, toilet paper, kites, playing cards, origami. It has been a transformative material.The downside is that paper production is a massive, global polluter on land, water and air. It is the third largest industrial, polluter in North America, the fifth biggest user of energy and uses more water per ton of product than any other industry.Paper in landfill sites accounts for around 35% of all waste by weight. Recycling helps but even the deinking process produces pollutants. Paper production still uses chlorine and chlorine based chemicals and dioxins are an almost inevitable part of the paper production process. Water pollution is perhaps the worst, as pulp mill waste water contains is oxygen hungry and contains an array of harmful chemicals and harmful gases and greenhouse gases are also emitted. It may seem as though reforestation is a plus, but these are low biodiversity environments. Paper is also unstable and decays. The acid was to prove fatal for many books as they decayed on shelves. This has led to mass digitisation process that have the added advantage of making the contents accessible on the web and searchable. With screen technology, the age of digital abundance could print to screens anything, anywhere at any time, giving unlimited scalability, even the capability to redo and edit writing by the writer and eventually even the readers (wikis). From seemingly nowhere, new technology, came along and didn’t just result in adjustment but profoundly reshaped, almost destroyed, even wiped out traditional paper technologies and practices. In the same way that the railways were wiped out by the automobile, as the railway owners didn’t see that they were in the transport not railway business, so paper-based newspapers, books, journals and encyclopedias have all been transformed by the web. The ready access to news on the web continues to crush the newspaper industry. They forgot that they were in the ‘news’ and not ‘newsPAPER’ business. So entranced were they by the technology of paper and printing that they at first refused to believe that this new kid on the block would survive, then reacted with blunt negativity. You still get huge amounts of sceptical coverage around web-based activity in newspapers, as journalists clearly feel threatened and are part of the old, paper paradigm. The shift to the digital printing presses turned out not to be the saviour of newspapers, merely a false dawn of cost cutting before the real dawn broke, where distribution to a global audience costs virtually nothing. The book business has been reshaped, largely by Amazon. First came the switch to online ‘One-click’ ordering and delivery. Amazon’s vast stock, low prices, smart use of scalable web technology and ease of use, shot it to a dominant position very quickly. Then camee-book readers, such as the Kindle, that started to reshape the very nature of the book itself. The traditional industry forgot that it was in the business of texts, not books. Suddenly, e-books were everywhere, downloadable, for free to your Kindle. The texts were readable, you could carry as many books as you wanted, especially when travelling, as the weight was zero and it had good battery life. A rather simple piece of software, wiki software, was used to devastating effect in Wikipedia, which literally wiped out the competition. A centuries old tradition of capturing knowledge in volumes, that were indeed physically volumous, was brought to a shuddering halt and collapse by a combination of smart technology (wiki) and a new practice afforded by another technology, the web. Once again, the publishers saw themselves as being in the encyclopedia, not the knowledge, business. Wikipedia trounced the traditional paper versions on every count. It’s free, searchable, bigger, weighs nothing, requires no storage, is multilingual, updatable, and copes with disputed knowledge on the edge of the more certain core. Paper has had a good thousand year run but it is increasingly being challenged by electronic screens. None of the traditionalists realised that their true core business was not in the delivery of paper but the delivery of text and graphics. They delivered atoms not bits. But atoms are expensive to produce, distribute and store, whereas bits are all but free to replicate, distribute and store. This has had a profound impact on learning, with more pedagogic change over the last ten years than the last thousand years. Guy Claxon has described the eraser as the "instrument of the devil". His point is that teachers need to see the wrong workings of the learner. He couldn't be more wrong. Learning is about the learner, not the teacher. 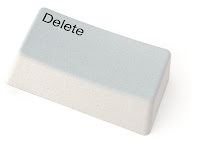 The eraser is a tool for the learner and has long been a useful tool in terms of self-regulated progress for learners. Erasure has been essential for learners and writers since writing began. From the earliest clay tablets to the wax tablets used by the Greeks and Romans a spatula-like scraper, or melting, was used for transitory information. Slates, were also erasable with nothing more than a little spit or a cloth. When ink was used in medieval manuscripts there was, on average, one error per page, so a piece of stone or pumice was used to erase the mistakes made in writing and copying. Then came bread and the pencil eraser. The eraser, that small, simple object, associated with the graphite pencil, has been a mainstay for students since graphite was used. Joseph Priestly describes the use of a ‘rubber’ for erasing graphite writing as far back as 1770. But it was an English inventor, Edward Nairn, who first sold ‘rubbers’. It was, curiously, the first practical use of rubber in Europe. Vulcanisation boosted its use in the mid-19th century as it gave ‘rubbers’ a longer life, as before this, they were perishable. The next step was to put them on the end of pencils, which happened in the US in 1858. Hymen Lipman’s patent failed, as it was felt to be a composite part of one device and not something separate, However, it became common for pencils to have erasures on the non-writing end from that point onwards. Pencil erasers come in a massive range of forms from the classic rectangular block, still popular (as the apexes are sharp for fine corrections), to conical erasers that fit on the tip of the pencil and eraser pencils where the rubber replaces the graphite. Then there’s novelty erasers in every imaginable shape and colour. Of course, teachers have also used erasers, especially after the widespread adoption of chalkboards in the early 19th century. 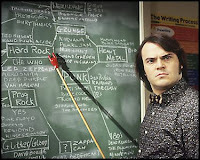 In fact, the success of the chalkboard is largely down to the fact that content can be erased with a simple felt pad. Sewall Wright, geneticist and legendary absent-minded professor took live erasure on his chalkboard literally, when he famously used one of his experimental guinea-pigs, by mistake, to wipe out work he had written on a chalkboard in his lecture! Erasure, the ability to correct mistakes, is a potent learning technique, as failure is a normal part of learning. This is especially true in learning writing skills. 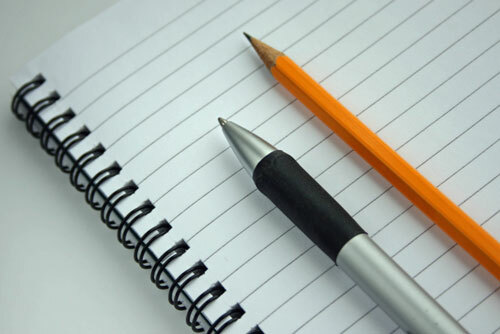 To hold and use a pencil is a difficult skill to master, as is letter formation, capitalisation, alignment of lines and the various degrees of skill that writing involves. Spelling is a lifelong, learning task. Few adults would feel confident in writing prose without access to a dictionary or spellchecker. This is especially true in languages, like English, that are highly irregular. Learning from failure goes far beyond spelling. It also applies to word order, sentence construction and the general structure of pieces of written prose. Even if one has mastered clear writing and spelling, good writing is achieved by rewriting. Erasure is an essential feature of good writing. The ability to correct mistakes and revise has always been useful for learners and writers. Indeed most serious learning theorists see failure as an integral part of the learning process. It is almost impossible to imagine a subject or skill that doe not entail huge amounts of failure eventually learning to success. Some, such as Roger Schank, see failure as the key driver behind learning. If you don’t make mistakes, you don’t learn. Interestingly, there was a fashion in primary education in the 90s to NOT correct spelling errors. This was the result of a disastrous ‘whole language’ or ‘whole word’ policy in teaching literacy. Children were encouraged to write without correcting spelling errors, as this was seen as a secondary skill, unrelated to reading. Whole language teaching was easier, felt intuitively right and avoided the perceived dullness of repeated practice on phonic components and sounds. Much of this has been usefully reversed with a renewed focus on phonics and other constructive techniques, as the research community came out and reacted strongly against the whole language method. Research has established that we do indeed rapidly sound out words, in silent reading, even in skilled readers. Comparative studies are also convincing on this matter. However, throughout the nineties, a groupthink phenomenon took hold where the teachers were all taught teacher training courses that adopted the method, attended the same workshops and bought the same textbooks. We are only now beginning to see how destructive this was. It was a disaster for generations of children. There is almost nothing as simple and effective as an eraser for correcting the errors of your ways. We know that correcting errors is a vital process for writing. We also know that literacy means knowing the irregular spellings of words and that writing is a skill that demands rewrites. All of this favours erasure as a learning and working tool. Witness the rise and success of word processing, where backspace, deletion, spellcheckers and electronic erasure, allows learners to correct mistakes with relative ease. No erasure, no learning - there's the rub! Chall J, Adams M (1900)Beginning to Read: Thinking and Learning about Print. MIT Press. Learning to Read: The Great Debate.. Harcourt Brace, 1996. Pen and pencil: Is mobile the new pen and pencil? The pen has undoubtedly been mightier than the sword as it is an instrument of learning not fighting. The great works of literature, religion, science, philosophy, politics and law were all written in pen and ink. The renaissance, Reformation, Enlightenment were all driven by the ability of minds to put pen to paper. As a piece of technology it remains a mainstay of learning. Indelible writing, with pens, is a truly simple yet remarkable piece of technology. So where did it come from? To write one needs something to hold in the hand which makes a mark. Cave painters used sharpened objects to inscribe on rock, sharpened reeds were used in Mesopotamia but it was the Greeks who first used a ‘stylus’ made of bone, wood or metal. They used this to inscribe wax tablets. The Romans then introduced bamboo pens to hold ink as you wrote. About 700 AD the feather-based, quill pen was invented. It was over a thousand years, in 1884, before the fountain pen was invented by Waterman. Necessity was the mother of invention when one of Waterman’s clients leaked ink over a contract and lost the deal in the time it took to draw up another contract. The internal capillary that regulated the flow of ink did the trick. Laslo Biro, a Hungarian journalist, patented the ballpoint pen in 1938. He sold this patent to the British Government in 1943 but failed to take out a patent in the US. It could deliver ink evenly and smoothly as the ball rolled across the paper and dried quickly. It was a massive success. The cheap, light and easy to use pen put writing in the hands of the learner. It is a learner-centric piece of technology that moved text on from the printing of separate letters to cursive writing, where letters were simplified and could be joined as one wrote the word. This is what gave rise to upper and lower case letters. The pedagogic weakness of the pen is that it is easy to smudge and difficult to erase. This makes creative and critical writing more difficult as it also limits editing, redrafting and reordering, the essence of good writing skills. It actually encourages the regurgitation of pre-prepared, memorised answers in examinations. In this sense a pencil is superior and keyboard far better in terms in terms of erasure, deletion, insertion, cutting and pasting. Of course, this begs the obvious question as to why most education systems still require pen work in examinations, when students barely use them. One could also mention the insidious ‘red pen’ marking, highlighting failure, rather than constructive, formative feedback. As any teacher and parent will tell you, pens also leak and can cause havoc, staining clothes, bags and flesh. Crude adolescent tattoos are also an unexpected consequence. Then again, they also make excellent pea-shooters! The advantage of the pen with ink over the reed used in cuneiform or stylus, is that it is much quicker to use for curved, cursive writing and leaves clear lines. It has been improved through split nibs, metal nibs, fountain pens, ballpoints but for nearly four millennia remained the mainstay for writing, until the advent of pencils, typewriters and computer keyboards. Nothing is more dangerous in classrooms than the pencil. They’re the perfect weapon, used to poke, prick and even stab others. Yet the humble pencil is a key piece of technology, used by almost every learner at some stage in their lives. Who hasn’t enjoyed the feeling of freedom of flow in writing and drawing that the pencil produces? Then there’s the simple fact that it can be rubbed out, your mistakes erased. That is what makes the pencil a great piece of technology. Pencils are said to contain ‘lead’, the graphite and clay mixture has no lead. It was called ‘lead’ as the graphite was thought to be a lead ore in the early days of chemistry. However, the paint on the wooden casing contained lead up until the middle of the 20th century and did pose a risk to health. Although the Italians Simonio and Lyndiana Bernacotti were the first to insert a graphite rod within a wooden case in the middle of the 16th century, the two wooden halves later carved and stuck together, the person usually identified as the inventor of the modern pencil was Nicholas Jacques Conte in 1795. He was an officer in Napoleon’s army and distinguished himself by organising a balloon demonstration on the Egyptian campaign. The first balloon went up in flames, convincing the Egyptians that it was a weapon of war, the second was successful and supposedly witnessed by 100,000 in Cairo. But he is now remembered as he inventor of the pencil. The only source of solid graphite in the world is in Cumbria England, where solid graphite pencils were cut from blocks but as France was at war with Britain they could not import graphite, so the ingenious Conte was asked, in 1795, to come up with a solution. He researched the problem and found that ground graphite could be mixed with clay then shaped them into thin sticks and baked them in a kiln. The thin sticks were then placed between two wooden halves and glued together. And so the pencil was born. The pencil protected by its cedar casing, as cedar doesn’t splinter when sharpened, stops the writer’s hands from being marked. It is also a superior drawing instrument as it can do lines of different width, texture and shading. The marks it makes, however, are very durable, but can be erased. Erasure is important in learning as the pencil forgives failure. Rub it out and start over. In this sense it has a clear pedagogic advantage in dealing with ‘failure’. It allows the writer to erase and rewrite. This was made even more convenient when the eraser was added to the end of the pencil, patented in 1858 by Hymen Lipman. They can also be used in zero gravity, which is why the early space missions used pencils. This is particularly useful when learning how to write. If we compare the pencil with the pen, we see that there is a pedagogic difference. It is more difficult to draw with a pen (apart from precise line drawing) and the pencil gives freedom of movement, flow and vast range of line width and shading. Pencils are wonderfully flexible. Mobile the new pen and pencil? The shift from the pen and pencil to keyboard on computers and mobiles raises some key issues for teaching and learning. First, a radical change in the forms of writing towards shorter, sharper txts, tweets, posts and emails. Second, a change in the input devices towards keyboards. Third, a shift towards writing on mobile devices. New forms of writing skill have become essential in the modern world: txts, tweets, posts, blogs and email. This is accelerating as new forms of written communication emerge. Indeed there has been a swing towards txting, at the expense of voice on mobiles, showing that there is a rise in writing by young people. Never have so many young people written so frequently to so many other people. Writing has moved from being a deliberate, formal activity to an ambient, every day activity, with mass participation. Yet these forms of writing are poorly understood, and rarely taught in schools. A corollary of this renaissance of writing by young people (increasingly older) is the use of keyboards, whether physical or touchscreen. This is a separate skill from writing with pen or pencil. It needs to be acquired and few workplaces require one to use a pencil or pen, most use keyboards. So why are keyboard skills largely ignored in schools an in exams? The ubiquity of mobile devices has led to massive, popular use of txting. Txting has now overtaken voice as the primary use of these devices. But also posts on Facebook, Tweets on Twitter, posts on blogs and email. Then there’s the calendar, note taking and other functions and apps that require writing. All of this points towards an irreversible change in our writing and reading culture. Writing has become more common but there’s a much greater range of styles. In terms of size we now have everything from tiny txts, 140 character Tweets, posts on Facebook/other social media sites and email. These short form writing tasks take skill. Being concise has long been the key skill in good writing and it is not easy to master. Far from being illiterate, most young people have developed superb writing skills in short-form writing. This is not to say that long form writing is unimportant. Reports, well argued essays, articles and books still have to be written. But these are far less important for the vast majority of people than short form writing. In any case, the writing technology of keyboards and word processors have also revolutionised long form writing, allowing deletion, insertion and cut & paste. Pens and pencils put learning in the hands of learners, and with pencils the marvellous addition of easy erasure. They facilitated the quick flow of writing, gliding across the paper and also gave the gift of subtle, shaded sketching and drawing to anyone who wanted to pursue that skill. However, we have to admit that the days of the pen and pencil are numbered or at least limited to a minor role in writing, as keyboards, computers and mobile devices have already become the dominant technologies of writing.